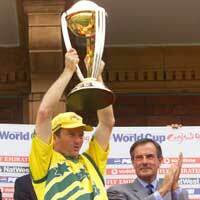 Seventh ODI Cricket World Cup was played in England between 12 International Teams. England, India, New Zealand, Australia, Pakistan, Sri Lanka, Zimbabwe, West Indias, South Africa, UAE, Kenya and Neterlands participated for the 7th Cricket World Cup tournament. Total 42 games were played at 21 different venues of England. The players as previous world cup wore coloured clothing, with names on the back. 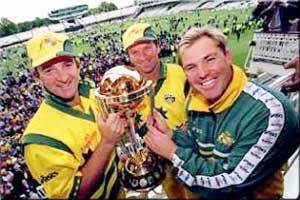 The fourth World Cup in England, with Super Sixes rounds for the first time won by Australia with consistent performances in tournament. 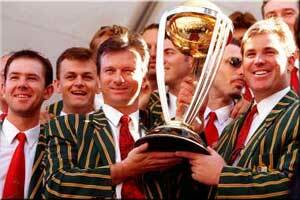 This was Australia's 2nd World Cup title. 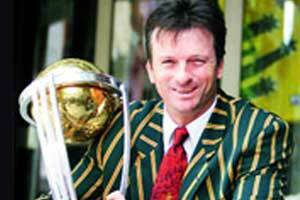 In Final match Australia beat Pakistan by 8 wickets (with 179 balls remaining) in 20.1 overs. 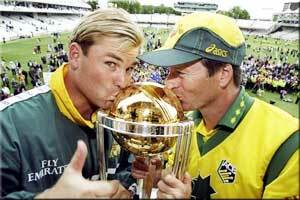 Shane Warne (Australia) was man of the match for his 4 wickets spending 33 runs in his 9 overs. The 12 entrants were split into two groups, and the top three in each group went into the Super Six, carrying with them the points they had earned against the two teams who had also qualified from their group. They then played the qualifying teams from the other group, creating a final all-played-all league table, with the top four going into the semi-finals and finally two teams for final.